After a couple of busy summer weeks, I found myself with a plethora of cucumbers from our CSA. I don’t have a problem with cucumbers, but I don’t necessarily go around eating them like bananas, either. I tried to hide some in a cucumber/hummus sandwich for the baby, but no dice – he promptly licked the hummus off of the bread and threw everything else on the ground. 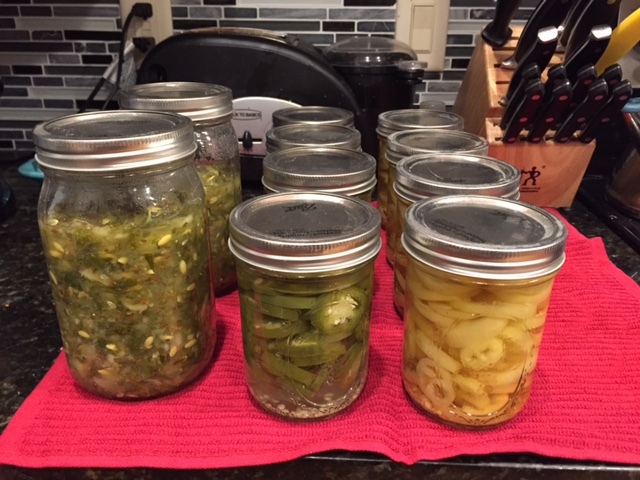 I like making pickle spears, but I went a little overboard last summer and still have quite a few jars. And so, day after day, I stared, uninspired, at a bowl of cucumbers. Biding their time, waiting to rot and attract seven million fruit flies. I admit, they got to me. I like clean. I like order. I am a minimalist who has manic episodes about clutter. This one ridiculous bowl was preventing my counter from being the clean, open space I like it to be at the end of the day. 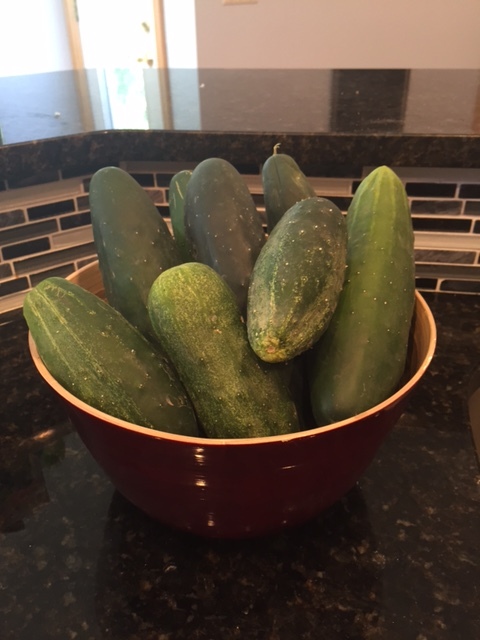 And yet, as we hustled through busy summer days, all I could do was say “someday soon, cucumbers!” and, for the time being, make like a Disney song and let it go. Here’s my big secret: I am really, desperately not good at letting things go. About three months after I had my oldest son, I started running. “Running” is an incredibly generous term, but I got out there and moved. And wow! Baby weight, pre-baby weight, weight likely still held over from middle school runs to Taco Bell, fell off. I was strong. I was thin! It was hard, but it was also easy – make a plan (tomorrow I will run three miles), follow that plan (run three miles), up the plan (next week I will run four miles). I ran, I ate junk, I felt skinny, I felt fit. I ran a marathon in the sticky Florida humidity and couldn’t walk down stairs for a week afterward. It was the best I’d ever felt about my body. And then life, as it does, had ups and downs and ups. I got pregnant and lost that baby. My body held on to the bloat that short pregnancy brought with it, and I struggled to embrace its new form. Three months later, I was pregnant again. I delivered my second son exactly fifteen months ago, and I am the same weight I was when I left the hospital on that windy May day. I know my body is different. I have resumed running. I ran a 25K at the beginning of summer; I am training for a half marathon now. I eat healthy, local, nutrient-rich foods, I limit alcohol, I don’t snack after dinner, I constantly chug water. So what’s the big deal, body? And to the latter, God firmly and gently answers, no. I strongly believe He watches me struggle, watches me get out and run, choose water over wine and make food from scratch. He looks on and says, continue in this journey. I am molding and shaping you now, as you struggle, to teach others about determination and acceptance. Answers don’t always come easy. Fixes don’t happen overnight (or in fifteen months, I like to add). God knows I do my best listening as I run and cook. If I dropped all of the “baby weight” quickly and didn’t need to focus so strongly on a fitness routine, I am sad to say I don’t think we would talk the way we do. And He knows that; of course He knows that. It doesn’t make me happy with my body. It makes me understand things a little bit better. It’s a pickle, I tell you. Dill relish, japelenos, banana peppers. No fruit flies! I wish I could close with “and then God blessed me with contentment for this season, over my body and whatever other struggle I will encounter on a daily basis.” I cannot close like that. But I can close by saying it is okay that I can’t close like that – that each day I learn, each day I grow. Just as time and vinegar turns vegetables into pickles, so shall time and God turn me into… well, we’ll see. I am loving your thoughts and so happy that you follow through on setting all this up. I think it’s so beautiful to look at food from a spiritual perspective and I’m happy to share that perspective with you! J – God loves you and so do I! Go to the Perfect Pickler website (I’m surprised I haven’t raved about this to you). I found the perfect pickler at Disney and now always make my own pickles – one year I pickled green beans because I had so many! And I struggle with body image too – although I am not a runner!